Another long awaited re-issue on Dark Symphonies here. 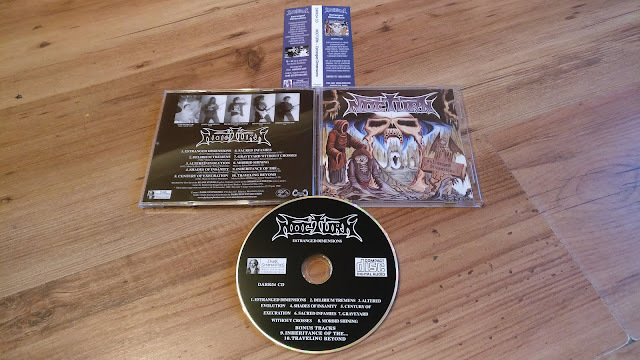 Dutch death/thrashers Nocturn with their only album 'Estranged Dimensions'. Originally issued on the long dissolved Old World Records' in 1991, this had been long out of print before Dark Symphonies did the right thing and aired it once more earlier this year for whomever seeks out such beautiful underground gems... and a gem this really is. Similarities abound of Mercyless or Protector, with a rabid, rasping sound - this is definitely one to dig in deep on if you've not come across it before. Comes with an OBI strip.